Have we finally found a good point? At last, here's something good to say about Apple Maps. According to analysis by data experts Onavo, Apple's in-house Maps app uses 80 per cent less data than Google Maps. That's right, it's around five times more efficient. That's because Apple Maps uses vector graphics, and so doesn't have to download map images again every time you adjust the view. The result? Less data consumed. Of course Google Maps does have an offline mode as well, which isn't taken into account here. But still, it's some good news for anyone who bought an iPhone 5. "On Google Maps, the average data loaded from the cellular network for each step was 1.3MB," Onavo says. "Apple Maps came in at 271KB - that's approximately 80 per cent less data! "On some actions, such as zooming in to see a particular intersection, Apple Maps' efficiency edged close to 7x." In Satellite View, Apple Maps uses around half as much data as Google Maps, Onavo found. 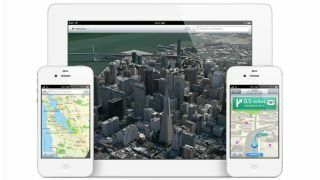 CEO Tim Cook posted a letter to customers on the Apple website last week apologising for the failure of Apple Maps. He even recommended anyone using iOS 6 try alternative navigation aids like Nokia Maps, Microsoft's Bing, or Google Maps. Apple Maps confused owners of iPhone 5s by putting entire towns in the wrong place, moving Heathrow Airport next to Hyde Park, and giving bridges and buildings a Dali-esque makeover. As a result, just 4 per cent of iOS 6 users are sticking with it. In his open letter, Cook said Apple is working hard to improve Apple Maps.